It’s Week 5 of the Official CCC Social Group CAL (crochet-along) and this week’s block is Starfire by the talented Melinda Miller from MoCrochet. Yes, you keen observer. Popcorn Parade (Week 2) and Basket of Berries (Week 4) were also designed by her. If you are not familiar with the Block a Week CAL, but would like to join in, you can find all the relevant information HERE. The post includes a list of all the blocks to date. 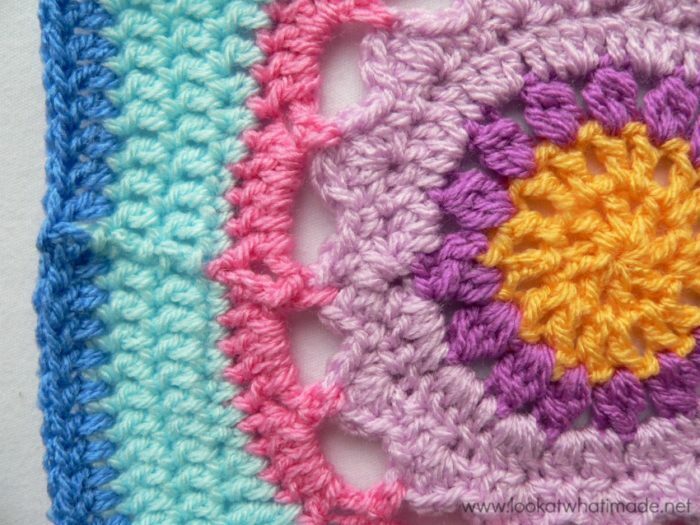 The Starfire Crochet Square is classed as intermediate, but just like Popcorn Parade and Basket of Berries, it is very simple. 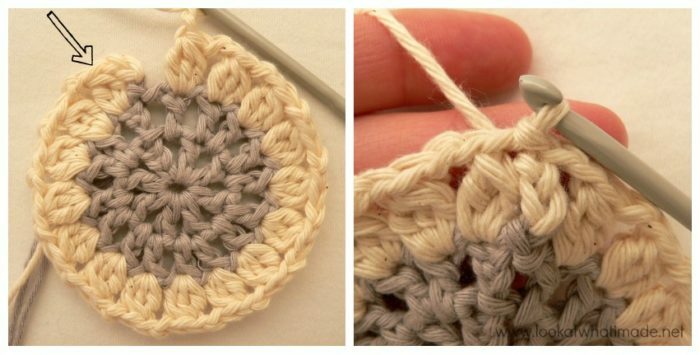 There is one speciality stitch (the Bobble stitch), for which I have provided a photo tutorial. You can find the pattern here on Ravelry. 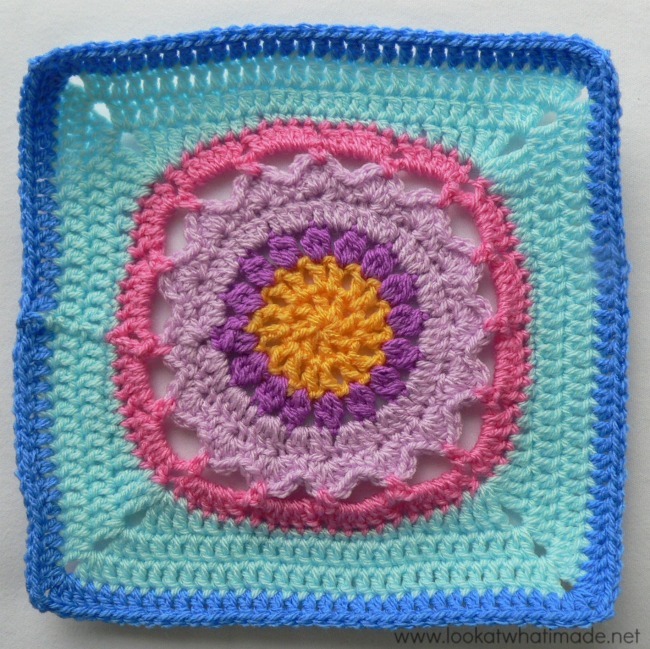 Using a 4 mm crochet hook (US G/6 UK 8) and double knit yarn, as I have done, your finished square will be about 8″ big. The initial ch st’s in each round are counted as a stitch. Sometimes the pattern indicates this, sometimes it does not. The only one that DOESN’T count as a st is the ch-1 at the beginning of Round 8. That is why the pattern tells you to sc in the same st as the ch-1 in Round 8 and why you join to the first sc at the end of the Round 8, not the ch st. Round 2: “sl st into 3rd of 4th ch” should be “sl st into 3rd of 4 ch st’s”. Round 8: 92 stitches, not 96. Some of the rounds do not include stitch counts so I have added them below. Like I have already mentioned, you can find the pattern here. The tips and tricks below are supplementary to the pattern, meaning that they will only help you with the pattern should you get stuck. This photo-walkthrough is NOT the actual pattern. 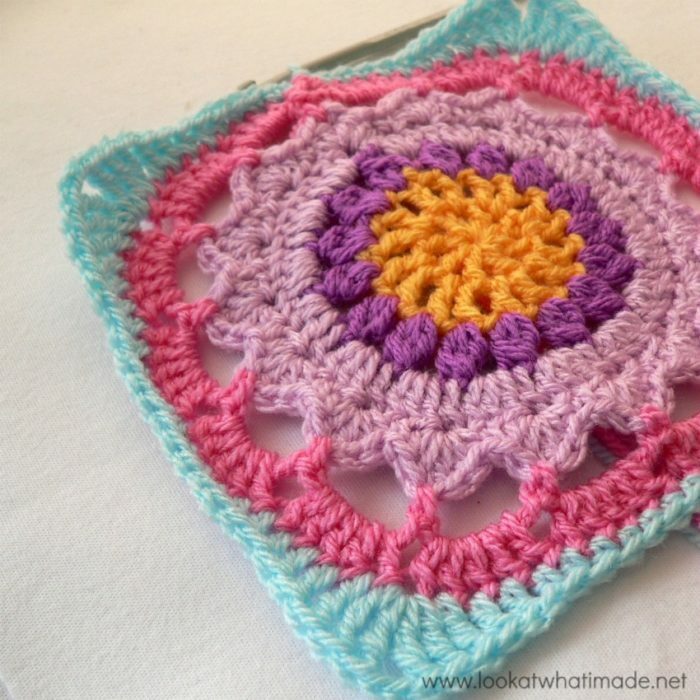 Thank you very much to Melinda Miller for giving us permission to do this photo-tutorial for her Starfire Square. And a special thank you to Kimberly Slifer for letting me do these tutorials and for obtaining the necessary permission. You CAN start this round in a magic ring, but I suggest that you don’t unless you are VERY comfortable with your crochet skills. See that little hole in the centre caused by making your stitches into the first chain (the one farthest away from your hook)? I have a tip to make it disappear. At the end of Round 1 you are told to sl st into the 4th ch of the beginning ch-5. Be careful with your counting here. The first chain stitch (the central hole) already contains all the other stitches, so don’t forget to count it as well. You should be joining to the fourth chain, not the fifth chain right next to the first dc, otherwise you will lose that first ch-1 space. See photos below. Stitch count: 8 dc’s and 8 ch-1 spaces. Remember that three of the initial 5 ch’s count as a dc. To get rid of the central hole, use your initial tail of yarn and thread it clockwise through all the stitches of the first round. Do this twice and then pull it tight. Now thread your yarn counter-clockwise through all the stitches and cut your yarn. 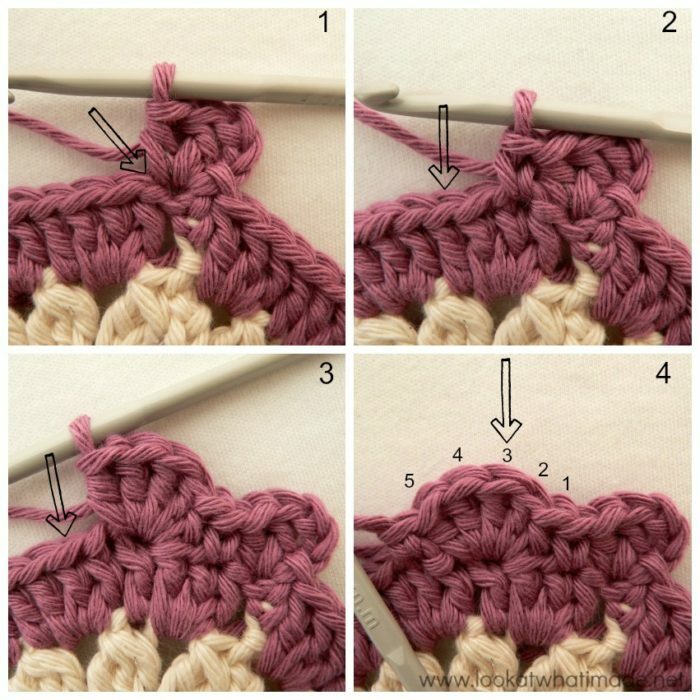 This might seem obvious, but you will need to skip one stitch when you start threading your yarn counter-clockwise (see central photo below). If you don’t skip a stitch when changing direction, you will just unravel the tail again. In this Round you will be working into each ch-1 space AND each dc. 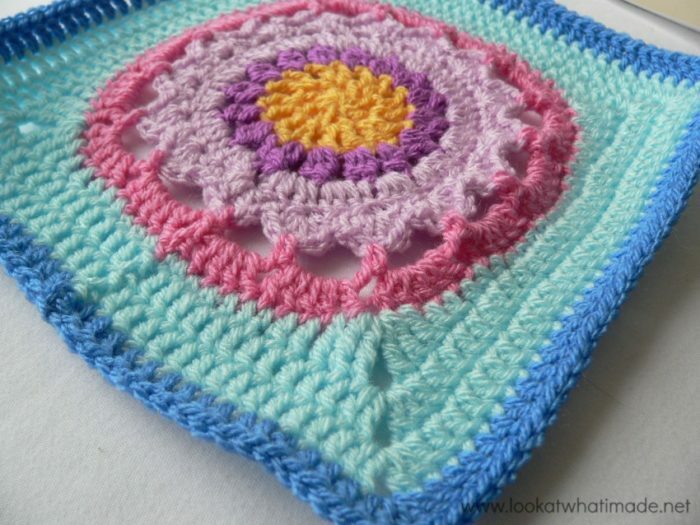 In this pattern there are quite a few places where the stitches appear “hidden”. 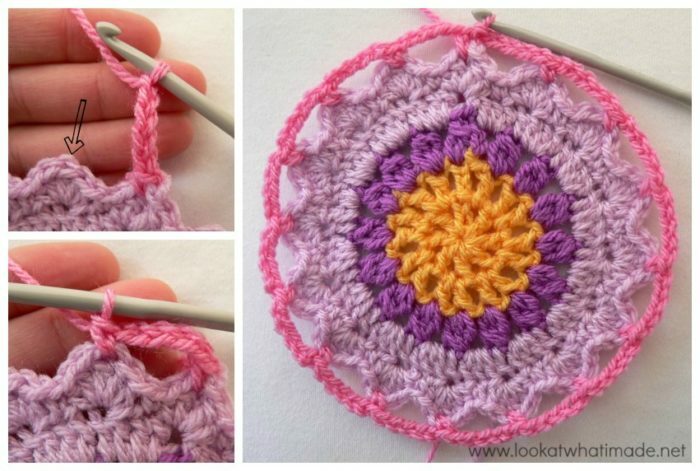 Please see this tutorial about hidden stitches to make sure that you know which loops belong to which stitch. Once you’ve made your first dc into the ch-1 space, the top of the next dc might be slightly hidden. Make sure that you work the next st into the dc (indicated with an arrow in the first photo below and illustrated in the second photo). To join the round, sl st to the third chain of the 4 initial ch st’s (last 2 photos below). 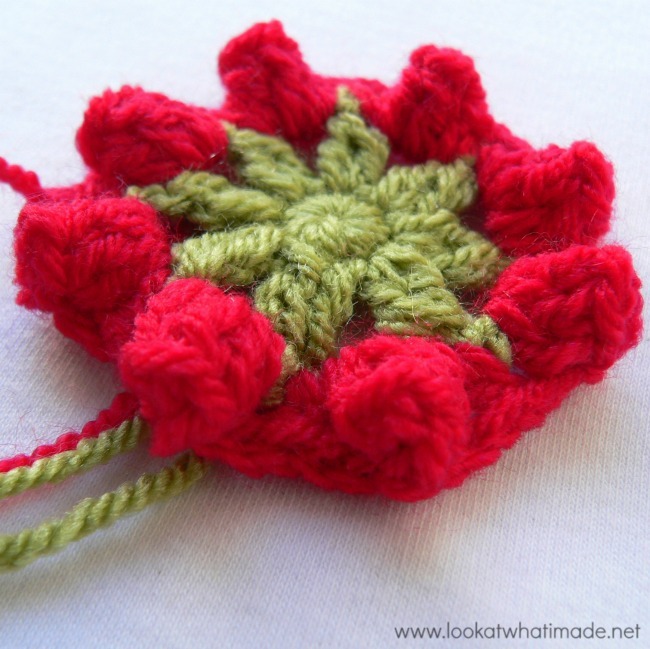 In this round you will be making 16 Bobble stitches, each spaced by 2 ch st’s. 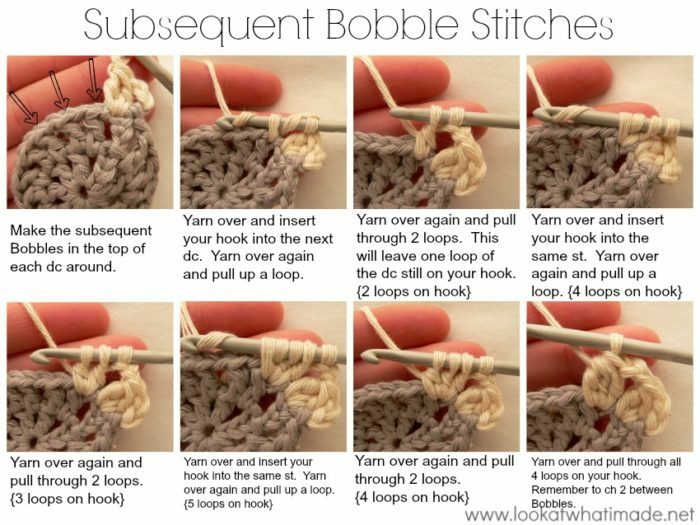 The Bobbles are straightforward, but just in case you’ve never made them, I have included two photo-tuts. 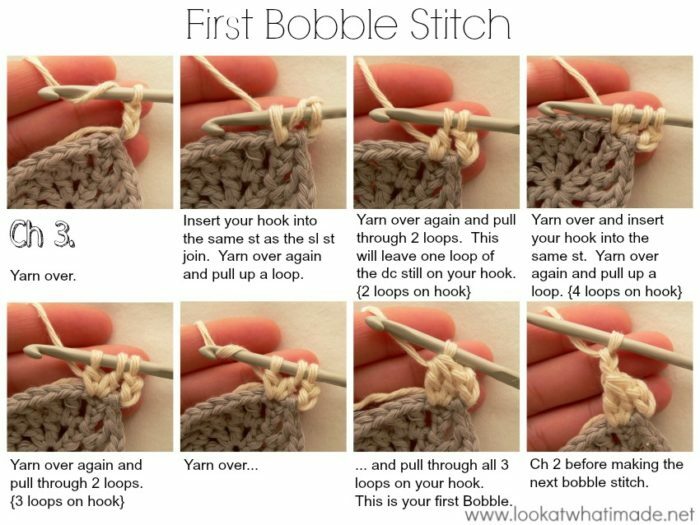 One shows you how to make the first Bobble and the other one shows you how to make subsequent Bobbles. When you get to the end of Round 3 you will need to join to the top of the first Bobble with a sl st.
Stitch count: 16 Bobbles + 16 ch-2 spaces. This round is simple, but the top of the Bobble stitches tend to be a bit hidden again. So after you have made 3 dc’s into the first ch-2 space, you will need to make a dc into the top of the next Bobble (indicated with an arrow in the second and fourth photos below and illustrated in the third photo). Hint: Count your stitches at the end of this round. I had to frog both my samples because I wasn’t paying attention and only made 2 dc’s in some of the ch-2 spaces. You are going to be MOST annoyed if you have to frog at the end of the next round, so count now. In this round you will work 16 “fans”, which consist of (hdc, 3 x dc, hdc). Photo 4 above shows one completed fan, with an arrow indicating the central stitch of the fan that you will need to work into in the next round. And this is what your square should look like at the end of Round 5. I know I am stating the obvious when I keep pointing out how pretty the flowers are, but I just can’t help it. 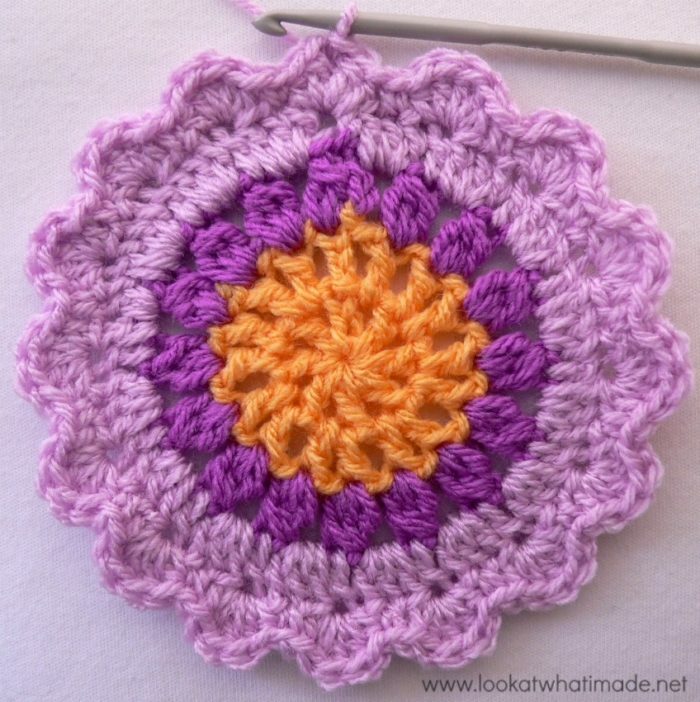 Every time I finish the central flower of a square I just want to stop right there and make a whole bunch more. At the end of Round 7 your work will pull up like a bowl. Do not be alarmed. All will be well again at the end of the next round. And now the circle starts becoming a square. In this and subsequent rounds, you will have to be mindful of those hidden stitches right after the corners. The seam on this square is a tiny bit obvious. My friend San (from Loopsan) has done a quick tutorial for getting rid of the seam. You can find that HERE. In all fairness I should also admit that I didn’t go to any particular trouble to avoid the seam. In fact, I didn’t even change colour on the slip stitch like I should have done. So my bad! All in all I loved this square. I think it was the quickest one of the whole bunch. And so simplistically pretty. I am completely enamoured with Melinda’s designs. I am SO confused and this should be so easy buy I cannot wrap my head around the part in this round where it says: In the first ch work (1 dc, ch 1) 7 times, sl st into 4th ch of beg ch-5. Pull beg tail to close the hole. BUT in your photos, you do not show these initial stitches. Then when I go back & read what you have it says: At the end of Round 1 you are told to sl st into the 4th ch of the beginning ch-5. Be careful with your counting here. The first chain stitch (the central hole) already contains all the other stitches, so don’t forget to count it as well. You should be joining to the fourth chain, not the fifth chain right next to the first dc, otherwise, you will lose that first ch-1 space. Paula, the photo (on my site) of the first round shows the initial ch-5 with the 7 dcs and the 7 ch-1 spaces made into the first chain of the initial ch-5. There is also an arrow pointing to the 4th dc of the initial ch-5, which is the stitch you should join to. The note is only there to remind you to count your initial chains very carefully so that you don’t accidentally join the the fifth chain instead of the fourth. So pretty Dedri! 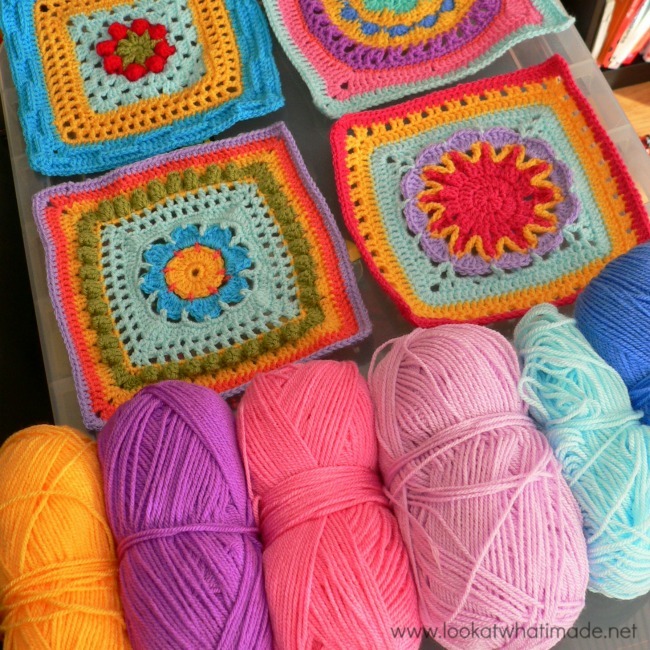 Your blanket is going to be stunning!